Not just an astronaut, but a physician, engineer and a dancer. And that’s just what appears in the subtitle! She’s a modern-day super woman. 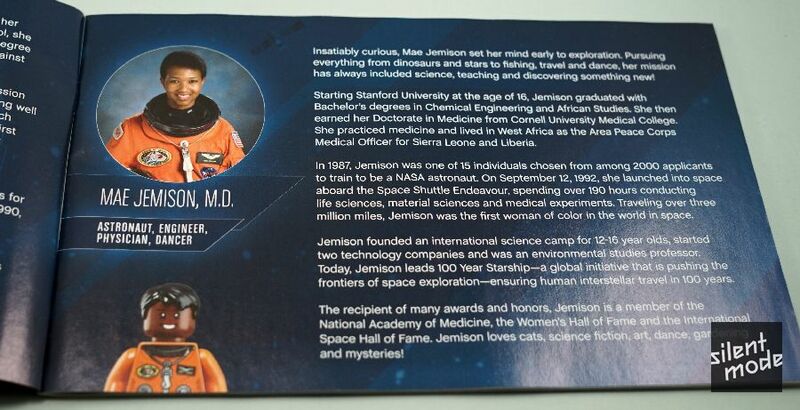 In relation to this set: she was the first “woman of colour” in space. For those of you who, like me, noticed and possibly complained about a lack of black females as LEGO minifigures… here you are. Mae’s outfit is meant to be a conventional astronaut suit, but it could also double as casual wear. The display unit for the space shuttle starts off a little differently, as we can see two spaces for those White name tiles. On top is a “support” in Dark Bluish/Stone Grey, which I haven’t seen used for goodness knows how long. With the base almost complete, we turn our attention to the focal part of the entire set: the space shuttle. The relatively new “droid head” round brick forms the nose, supported by a 2L Technic axle. 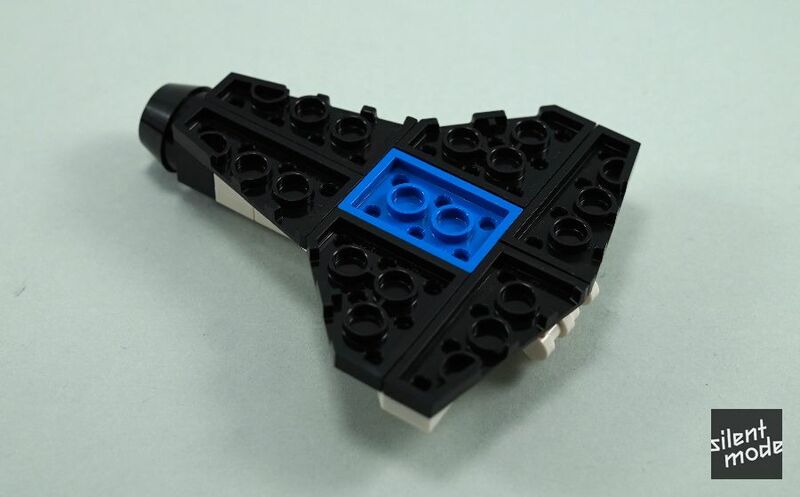 Look how these wedge plates are used to form the overall shape of the shuttle. The Blue 2×3 plate in the middle is no accident, either. Adding the White elements for the craft body, and this is starting to resemble a standalone polybag set. 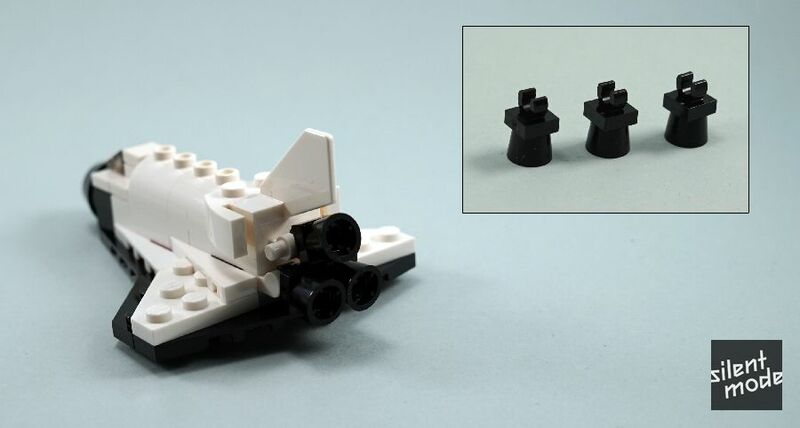 Personally I think this shuttle should be re-released as its own set, and perhaps you’ll agree once you see it complete. This was a particularly clever part of the build. Only the fez (trophy base) piece could have worked in this situation, and they look great arranged in a triangle like this. 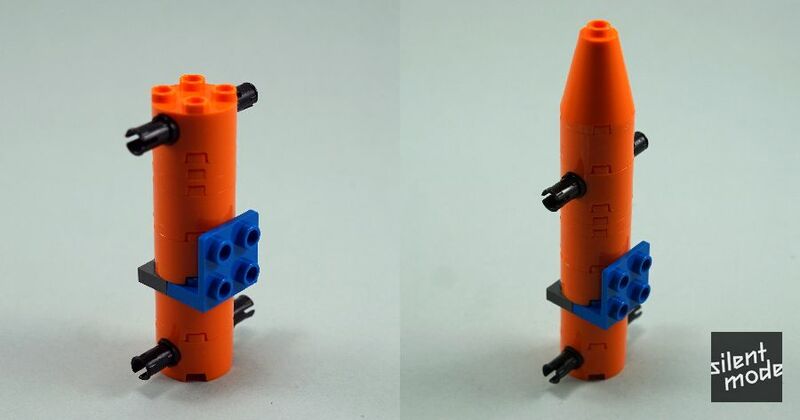 Somewhat less impressive is the build for the supporting rockets and fuel tank, starting with a stack of Orange parts. In use here are a couple of 2×2 round bricks with Technic holes on the sides, which made their debut a few years ago. They’ve taken a while to become more commonplace, and criminally they’re still not available in White. 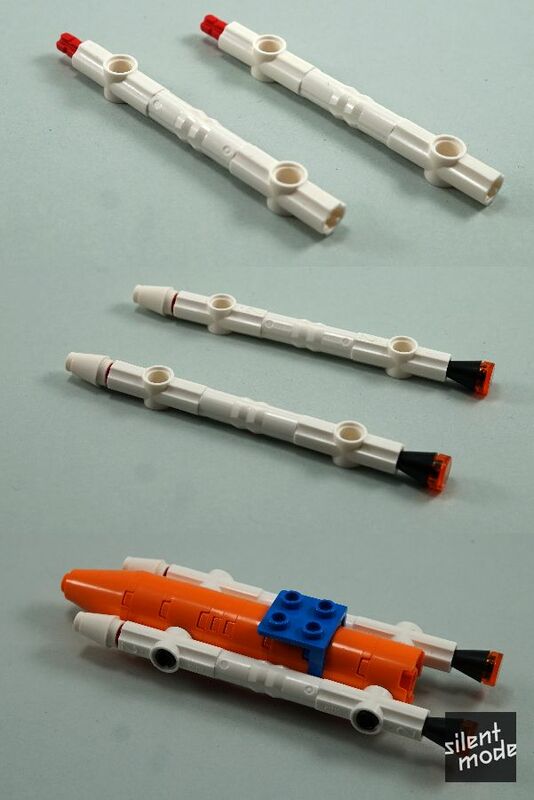 The rockets accompanying the fuel tank are simply Technic connectors, with a few System parts attached for good measure. The clearance caused by the red Technic axles really irks me, while the use of Black ice cream cones for the jets seems out-of-place. However, I don’t have any suggestions for improvement. The Blue 2×3 plate on the shuttle, combined with the Blue bracket on the fuel tank, indicates the connection points. That’s another very clever feature, considering that neither of the Blue elements will be seen. 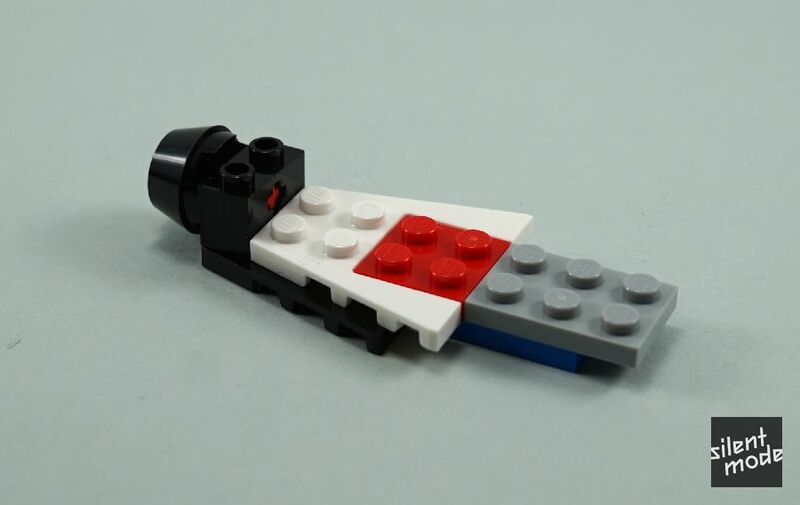 And there you have it: the completed space shuttle build. 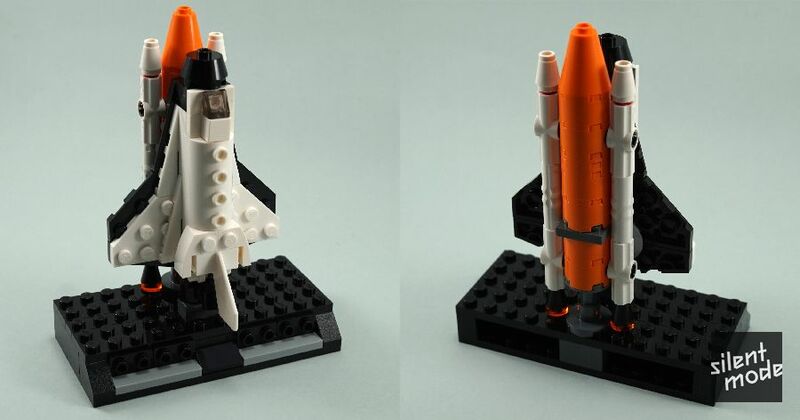 The fuel tank and rockets look comically small compared to the shuttle, but it all serves a higher purpose. The very bottom of the fuel tank attaches to that Dark Bluish/Stone Grey support on the display unit, allowing the shuttle to securely stand upright.